On this date in 1539, the Spanish Inquisition had Aztec noble Don Carlos Ometochtzin (or Don Carlos Chichimecatecuhi, or Don Carlos Ahuachpitzactzin) burned at the stake for reverting to the pre-Columbian indigenous religion. Surprisingly, this execution stands out as an exception in the first generations of its conquest. It even cost the first bishop of Mexico, Juan de Zumarraga, a reprimand for his excess severity. Why? Certainly any European Christian would have had trouble with the Inquisition if, like Don Carlos (Spanish Wikipedia entry | English), he had been caught with idols of Xipe Totec in his place. And that created for the Spanish a problem: how stringently to insist upon an alien orthodoxy for its new subjects? The problem was pragmatic at least as much as it was theological, because the business of winning converts for Christ had to coexist with the business of running an empire. 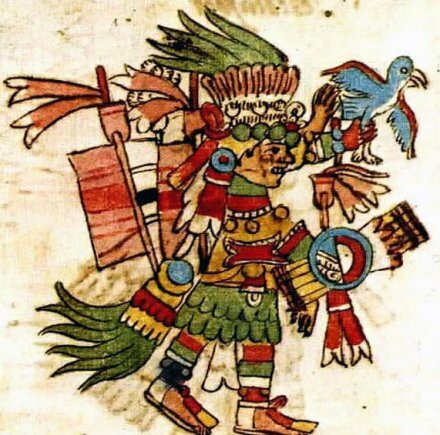 No sense provoking civil war just because the newest souls in the fold don’t have the Te Deum down; Cortes himself, in his initial conquest, had prohibited human sacrifice but not risked closing native temples. * That wasn’t done until 1525. Over the 1530’s, a campaign unfolded to pare down the many holdover native behaviors — polygamy, idolatry — and cement Christianity. Of particular concern were the “converted” elites who had both means (their social position) and motive (privileges lost to the Spanish) to use nostalgia for the old ways to make trouble. So, a powerful indigenous priest who “converted” and then went about preaching heretically was investigated by Zumarraga, wielding the Inquisitorial authority, in 1536. But even that didn’t draw a death sentence. Who are those that undo us and disturb us and live on us and we have them on our backs and they subjugate us? … no one shall equal us, that this is our land, and our treasure and our jewel, and our possession, and the Dominion is ours and belongs to us. Don Carlos was ultimately acquitted of the idolatry stuff, but convicted of heretical dogmatizing. So far, so good, right? Executions for heresy might be horrible in general, but if you live in a world where they’re routine, surely having your colonial satrap out there calling the empire parasitical, and telling the unwashed masses to go ahead and take multiple wives (Aztec elites seem to have been especially piqued by the lifestyle austerity preached by Franciscan missionaries) is the sort of thing that’ll get you burned at the stake. ** And there were plenty more like him out there. But though the Christianizing campaign of the 1530’s would continue in many forms for decades still to come, the bloodletting which Don Carlos figured to presage was abruptly canceled. When the Inquisition was formally instituted in New Spain in 1571, the native populace was explicitly outside its jurisdiction: its job was to monitor the European population for covert Protestants, Muslims, and Jews. Although this development has to count as a break for the locals, it’s interesting to note that the theological superstructure of the Spanish policy tension between religious conformity and practical colonialism turned at least in part on a condescending dispute over the “capacity” of Indians to truly become Christian. In that dispute, Zumarraga and his Franciscan order were the ones who thought more highly of the indigenous “capacity”, as against the more skeptical Dominicans; the logical consequence of the Franciscan position was to impose upon those capacious natives the fullest severity of God’s law. * Though not to be underestimated is the persistence within the citadel of Christendom of everyday folk beliefs, and occasional social movements, at odds with ecclesiastical dogma.